It's not just a note application. 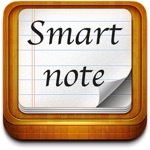 note is not only text,you can quick add note used record,doodle,image and so on. 2,GPS.you can get detail address where you add the note. 3,tag.custom define tag used for single note. 4,global search:from all notes or only one tag and type. This app occupies the 1059820th position in our ranking with 25 points. It is among the 25% best ones of its category.